Former NSA Sambo Dasuki: Based on EFCC investigations and findings alone (this is beside the ongoing $2.1 billion military equipment scandal), N126 billion, over $1.5 billion and 5.5 million British Pounds embezzled through his office. Former Petroleum Resources Minister Dieziani Alison-Madukwe: In just one of the cases the EFCC is investigating involving her, about N23 billion is alleged to have been embezzled. She is also involved in the Strategic Alliance Contracts of the NNPC. About $3 billion was involved. Alex Barde, former Chief of Defence Staff: N8 billion (N4 billion in cash and property recovered). Former Customs CG Inde Dikko: N40 billion (N1.1 billion cash and choice properties recovered). Air Marshal Adesola Amosu: N21.4 billion (N2.8 billion cash, 28 properties and three vehicles recovered). Former FCT Minister Bala Mohammed: N5 billion. Interim forfeiture order on some property secured. Former Niger State Governor Babangida Aliyu: N1.6 billion allegedly collected from NSA. More names of Nigerians who allegedly looted the treasury during the Peoples Democratic Party (PDP) administration were released yesterday. 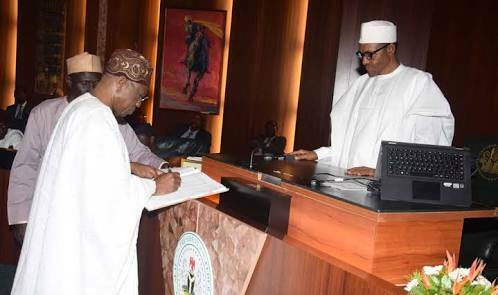 In response to the challenge thrown by the PDP to make public the list of “looters”, Minister of Information Lai Mohammed on Friday listed five and how they allegedly dipped their hands in the till. He listed PDP chairman Uche Secondus, who is threateneing to launch a legal battle to defend his integrity, Dr. Raymond Dokpesi, Mr. Olisa Metuh, Mr Waripamo Dudafa and Robert Azibaola as “looters”. Yesterday, Mohammed listed of 23 names, saying the lists are “not arbitrary”. The list is made up of three senators, five former ministers, two former governors, three ex-military chiefs, three aides of former National Security Adviser (NSA) Sambo Dasuki, a former Customs boss and a former permanent secretary, amon others. They are: Dasuki, Air Chief Marshal Alex Barde, Gen. Kenneth Minimah, Air Marshal Adesola Amosu, ex-Customs chief Inde Dikko, former FCT minister Bala Mohammed, former Petroleum Minister Diezani Alison-Madueke, Senator Stella Oduah, Senator Peter Nwaoboshi, Senator Jonah Jang, ex- Niger State Governor Babangida Aliyu, ex-Oyo State Governor Rashidi Ladoja, , former Minister Bashir Yuguda, Former Minister Nenadi Usman, Former Minister Femi Fani-Kayode, Former Minister Tom Ikimi, former Permanent Secretary Godknows Igali, former presidential aide Hassan Tukur, former Dasuki aides Aliyu Usman and Ahmad Idris, former Dasuki associate Aliyu Usman Jawaz and Benedicta Iroha. Releasing a fresh list of alleged looters, in a statement issued in Lagos yesterday, the Minister of Information and Culture, Alhaji Lai Mohammed, also said those complaining that the list was too short apparently did not understand that it was strategically released as a teaser. "At the press conference where the list was released, I did say it was a tip of the iceberg. Apparently, this does not mean anything to people whose style is to comment on issues they barely understand, or just to shoot down anything coming from the government,’’ he said, adding that the Federal Government has a large number of alleged looters on its list. Mohammed slammed the PDP for daring to challenge the Federal Government over an issue that the party knows is its weakness: looting of public treasury. ‘’What was the PDP expecting when it challenged the FG to name the looters of the public treasury under the party’s watch? Did the PDP actually believe that the massive looting under its watch was a joke? Did they think it is April Fool?’’ he queried. The minister said the PDP’s reaction to the looters’ list showed that its apology was an election-induced act, contrived to deceive unsuspecting Nigerians to vote for the party in the 2019 general election, even when it has not come clean on its looting spree during its time in office. ‘’The hysterical and panicky reaction from the PDP has shown that the party is not at all sincere about its choreographed apology. Were it not the case, the party would have followed in the footsteps of one of its leaders, Senator Ibrahim Mantu, who simply owned up to his role in the party’s rigging in the past elections and said he had turned a new leaf. ‘’It is said that a true confession is done in humility with an attitude of repentance. It is clear that the PDP does not know this, hence its resort to hubris instead of humility and genuine penitence,’’ he said.